I think it is probably true that President Tony Saca of El Salvador has met with George W. Bush more times than any other Latin American leader during the past three years. The topics are almost always the same: Bush thanks Saca for being committed to freedom and contributing troops to the coalition in Iraq. Saca seeks assurances that Temporary Protected Status will be extended to prevent 220,000 Salvadorans from being deported. They both speak about their commitments to free trade. Yesterday, November 29, Tony Saca again paid a call on the White House. One additional message in his remarks this visit was a pointed remark about growing "populism" in Latin America threatening constitutional democracies. It was a remark aimed at Hugh Chavez in Venezuela, but was also a shot at the FMLN. An important factor when considering policies to address poverty and related issues in El Salvador is the relative youthfulness of the Salvadoran population and the number of teen pregnancies. According to a recent article in Diario CoLatino, thirty percent of all pregnancies in El Salvador involve mothers between the ages of 15 and 19. This is perhaps not a surprising figure, since the article states that 24% or 1.4 million of El Salvador's 5.9 million inhabitants are adolescents. This photo from El Faro shows the early start of campaign tactics heading towards 2009 national elections in El Salvador. The signs appearing on trees and posts in San Salvador speak of "FMLN 2009 -- El Salvador Chavista ," a reference to Hugo Chavez, the outspoken leftist leader of Venezuela. The FMLN says these signs are not part of its campaign, instead they appear to be part of the right's play book to tie the FMLN in the public's mind to Venezuela and Cuba (not very hard to do given the FMLN's traditional admiration of Chavez and Castro). ARENA hopes to play on fears of how the US would react to a government in El Salvador tied to Venezuela. Today in Dubai, United Arab Emirates, Salvadoran archer Jorge Jimenez triumphed. Jimenez competes in the compound bow event and won the 2007 world cup, defeating the current world champion. Writing about Jimenez' gold medal, El Diario de Hoy labeled him the "Salvadoran Robin Hood." SAN SALVADOR, El Salvador/GENEVA, 22 November 2007 (LWI) - Christian Chavarria was just four years old when civil war broke out in El Salvador in 1980. It lasted 12 years during which some 80,000 people died, millions were left homeless, while thousands more simply disappeared. The 31 year-old Salvadoran remembers clearly the day a group of armed soldiers entered his home, fired shots at his brothers then aged seven and nine, and uncle, and pushed the younger boy against a wall, leaving him unconscious. He came to only to find his relatives' corpses beside him, and spent the next two days in the house until his parents rescued him. The armed men had apparently been looking for his mother, one of the principal leaders of the insurgency movement at that time. Our open air meeting, with residents in one of the coastal areas worst hit by the 2001 earthquake, and with other communities around this small, and poor country, was organised by the Fundasal. This is a nearly 40 year old Salvadoran NGO that has developed a track record working with low income people, so successfully that in 2004 won the World Habitat Award for its post 2001 earthquake recovery work. San Salvador's historic center has many important building from its history including the National Palace and the Metropolitan Cathedral. And this time of the year, it becomes a location of conflict as the number of informal vendors on the streets swells by thousands in the Christmas shopping season. San Salvador authorities try to place some rules on where vendors can sell their wares, and violence can break out when the police try to dislodge the informal stores from a street or sidewalk. This weekend violence broke out as the police tried to enforce rules against the informal stalls being set up on the grounds of the National Palace. Every year it's the same. Human desperation to earn money in the informal economy clashes with the need of any city government to preserve a semblance of order and to make streets passable for traffic and pedestrians. Today is the third anniversary of the creation of this blog. It's been a great experience in more ways than I would have predicted. Over the course of those years I have posted 933 times, on just about any topic so long as it had a connection to El Salvador. So in the past couple of days I have been looking back at what the visitor logs show about what has interested people and brought them to the blog. 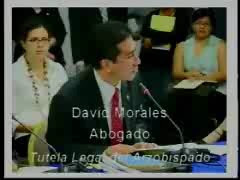 This post is an update on what is known about the the assassination of three Salvadoran members of the Central American parliament while they traveled in Guatemala in February 2007. The initial investigation by authorities in Guatemala quickly arrested members of the organized crime division of Guatemala's national police. But in a brazen raid, unknown persons managed to penetrate Guatemala's high security prison and execute the suspects in their cells. Since that time, the most promising leads have apparently been cellular telephone logs of calls to and from the now dead killers. This past August, press reports in El Salvador and Guatemala indicated that one person implicated as making calls with the killers around the time of the murders is Guatemalan mayor and legislator Manuel Castillo. According to those same reports, Castillo has been implicated for a number of years in narco-trafficking in the region. November 16 is the 18th anniversary of the cold-blooded murder of six Jesuit priests at the University of Central America, their housekeeper and her daughter, by members of the Salvadoran armed forces. So what really remains from the martyrdom of these six Jesuits? I believe and hope their spirit remains, that they rise again, like Archbishop Romero, in the Salvadoran people, that they continue to be a light in this dark tunnel, and hope in this country of endless misfortunes. All martyrs rise again in history, each in their own way. Archbishop Romero's is exceptional and unrepeatable, but Rutilio Grande is also present in many peasants, the North American sisters are still alive in Chalatenango and La Libertad, Octavio Ortiz in El Despertar, and the hundreds of martyred peasants in their communities. Washington, DC – The International Republican Institute (IRI) will honor Elías Antonio Saca González with the 2007 Freedom Award for his leadership in building on a quarter century of dramatic democratic and economic progress in El Salvador. Sunday, November 11, saw the general convention of the FMLN, where Mauricio Funes was officially made the party's candidate for president in the 2009 elections. The convention was a huge political rally in Cuscatlan Stadium in San Salvador as more the 50,000 red-shirted supporters assembled to celebrate what many believe is the party's best chance since 1992 to win the top elected position in the country. You can watch an FMLN video advertising the convention. View a photo gallery from the FMLN of the convention, or watch a short video excerpt of Funes' speech to the filled stadium. You can also read the text in Spanish of Funes' complete speech. For an introduction to Salvadoran literature, a good place to start is the website of Qiuvo, a regular commenter on this blog. At this page, Qiuvo has created an introduction to the works of three great Salvadoran authors of the past 100 years -- Salarrue, Roque Dalton and Manlio Argueta. I recommend it. Over the past three years, I've learned of a number of authors who read this blog. (I can't affirm that they read the blog regularly, just that they have either sent me an e-mail or mentioned the blog in something they wrote). Here is a list of books by those writers:Freedom of Expression in El Salvador: The Struggle for Human Rights and Democracy by Lawrence Michael Ladutke. This book explores the fragile state of freedom of expression in El Salvador following the 1992 Peace Accords. Enrique Alvarez: Life of a Salvadoran Revolutionary And Gentlemen by John Lamperti. Fascinating biography of Enrique Alvarez Córdova, son of one of El Salvador’s ruling families, who became convinced of the need of reform in El Salvador and ultimately became a leader of the Democratic Revolutionary Front (FDR). Alvarez was assassinated in 1980 at the beginning of the civil war. The struggle of local communities to block the construction of Santa Ana's new landfill continues. Two weeks ago, riot police and various persons clashed near the landfill site. Yesterday, protesters began an indefinite hunger strike to bring attention to their cause. The communities around Cutumay Camones fear the contamination of their drinking water by a poorly planned and poorly situated landfill. Today, a special commission on the handling of solid waste in the country issued a report on the situation. In the report the commission established that the business PRESYS, S.A. de C.V. was not qualified to construct the sanitary landfill due to its lack of experience in projects of this type, its lack of installed capacity, and its lack of previous contracts. Final results for studies on the construction of an initial 150km section of the Longitudinal del Norte highway in northern El Salvador are expected to be completed in February 2008, an official from public works ministry MOP told BNamericas. Two reports for these studies - being carried out under a US$9.3mn contract awarded to a consortium between El Salvadorian company Consulta and US firm Parsons Brinckerhoff International - have already been handed in, with a third one expected soon, after which bidding will be called for preliminary works on the section, said the MOP official. The economic news from El Salvador is all about inflation. The price of a pound of beans has risen from 50 cents to $1.25 yesterday according to La Prensa Grafica, and the price of corn has gone from 50 cents a pound to one dollar. The price of gasoline has gone up 27% according to El Mundo. Increased fuel costs have lead the operators of bus companies throughout El Salvador to threaten a national strike unless the government increases the subsidy paid to them. The price of a box of tomatoes which had been 20-23 dollars, now commands between 32-34 dollars according to Diario CoLatino. The causes are varied: the demand for corn created by US ethanol policy, a bad harvest for beans and other vegetables, record world oil prices. The solutions are scarce. The Doing Business Project is an exercise of the World Bank to measure the barriers to doing business in a country. The project starts from the assumption that countries which lower barriers to the establishment of businesses and which allow business flexibility are more likely to see economic development which can advance prosperity and reduce unemployment and poverty in a country. The 2008 results are now available at the Doing Business Project website. El Salvador receives an overall ranking of 69 out of 178 nations reviewed. The weakest rankings for El Salvador came in the area of government regulation and bureaucracy. For starting a business, El Salvador ranked 130th and for dealing with government licenses, the country ranked 121st. See every metric for El Salvador in this print report. This is certainly an improvement, although there is a long, long way to go before El Salvador can be seen as a country with a "normal" level of violence. We can expect to see ARENA pointing to the reduction as evidence of the effectiveness of its policies as the political campaigns continue to heat up. In adopting the General Amnesty Law, the State has violated Article 2 of the American Convention. 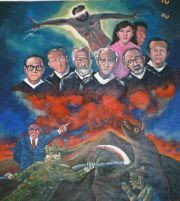 In addition, by applying it to [the Romero] case, the State has violated the right to justice and its duty to investigate, try, and make reparations, established in Articles 1(1), 8(1), and 25 of the American Convention, to the detriment of Monsignor Romero's next-of-kin, the members of the religious community to which he belonged and Salvadoran society as a whole. November 2 is the Day of the Dead (Dia de los Difuntos), commemorated in El Salvador and throughout Latin America. Family members visit cemeteries where they beautify the gravesites of relatives and loved ones with flowers, paint, whitewash and other decoration. La Prensa has a photo galleryof preparations at certain cemetaries and another photo gallery of sights from family activites today.